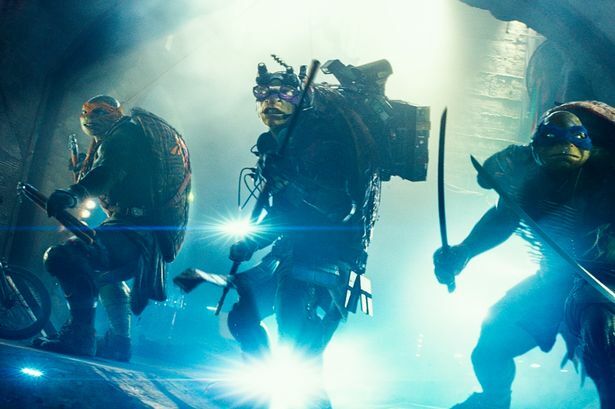 Graham Young reviews Teenage Mutant Ninja Turtles 3D/IMAX. You&apos;ll need an acute sense of “turtle recall” to remember the big screen debut of four of the most unlikely villain-chasing dudes in cinema history. But, 25 years after the first Ninja Turtles’ movie, the return of the reptilian heroes in a half-shell is surprisingly enjoyable. We learn how the Turtles were created and trained to fight by a bewhiskered rat, Master Splinter. There are plenty of distracting plugs for Pizza Hut, too. That’s the wrong kind of cheesy. Meanwhile, New York City is under threat from the Foot Clan run by evil boss Shredder. After four years in journalism school, TV reporter April O’Neil (Megan Fox) is eager to land a scoop to make her cameraman Vern (Will Arnett) and equally dismissive boss Bernadette (Whoopi Goldbert) eat their own words. Unexpectedly, tracking down the turtle-necked crimefighters Raphael (Alan Ritchson), Michelangelo (Noel Fisher), Donatello (Jeremy Howard) and Leonardo (Pete Ploszek) puts her own life in peril. Hollywood may be recycling its staple characters quicker than the average plastic bottle these days but credit to producer Michael Bay for reimagining the Turtles’ capacity for cartoon-like, child-friendly mayhem based on the 1984 Mirage Studios’ comic book series by Peter A. Laird and Kevin B. Eastman. Here, Wrath Of The Titans’ director Jonathan Liebesman takes a while to set up the story after beginning with some dodgy hand-held camera work (memo to Hollywood: see Belfast-based thriller ‘71 to learn how to do it properly). But this is still a big, fun, ultra-dumb picture which put a smile on my face, excited my son and youngest daughter and made the mixed-age audience around me laugh out loud. Who’d have thought? The set up is pure James Bond, Shredder now coming off somewhere between Darth Vader meets Robocop and Wolverine. A downhill chase spectacularly reinvents the ski sequence in On Her Majesty’s Secret Service and you’ll know what to do next time you’re stuck in a lift – dance! With a thunderous score by Marvel genre king Brian Tyler, there is, of course, only one new phrase to describe this money-making feast: cowa-wonga!